Thinking about great African soccer players, Alhaji Momodou Njie ‘Biri Biri’ doesn’t automatically come to mind. That might be, but in Gambia he is considered a better player than Diego Maradona. Sevilla-bron Spaniards agree, although they know they are stretching the truth. But nobody will argue that Biri Biri was more instrumental in his Sevilla-years than Maradona was during his season at the same club. 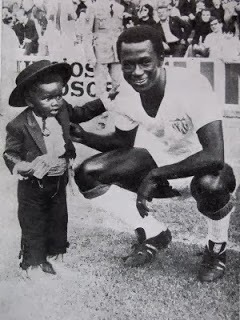 After the Second World War, it became more and more obvious that Africa was a great market for soccer talents. Portugal and France quickly saw this potential and hauled some great talents to their league. 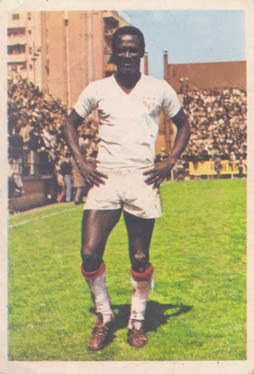 Portugal for instance had Lucas Matateu, Mario Coluna and Eusébio from Mozambique, and lesser known players from Angola (Santana and Yaúca (both Benfica)) and Guinee-Bissau. France did even better. Hundreds of African players came to French league. Just mentioning Salif Keita (Mali), Rachid Mekhloufi (Algeria), Eugene Njo-Lea (Cameroon), François M’Pele (Congo Brazzaville) and Sekou Touré (Ivory Coast) says it all. Back in England, everything remained quiet. Although soccer was immensely popular in for example Tanzania, Zambia, Nigeria and Rhodesia, English scouts were not looking for local talents in Africa to play in their league. Probably because the clubs thought those players wouldn’t never be good enough. 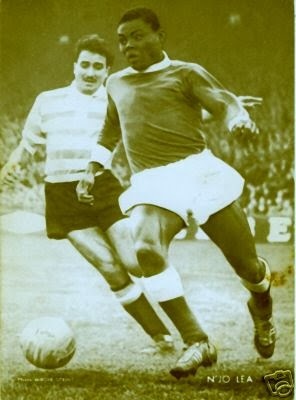 Let alone if such a player was from Gambia, the smallest country on the African continent with a population way under one million back in the sixties. Alhaji Momodou Njie ‘Biri Biri’, was born in Banjul on March 30, 1948 and considered the best player in the country by far. There was some sort of national league in Gambia in those days, but it still was a miracle how the word got out to England that there was a potentially great soccer player in that country. Anyway, Biri Biri was allowed to travel to England for a trial at Derby County. The deal fell through as manager Brian Clough, who was always right about everything, didn’t think he was good enough. So Biri Biri went back to Gambia, continuing to play in the Gambian league. Of course he also played for the national team - losing nearly every single match as the team was very weak. Then, in 1972, 24-year old Biri Biri finally got his break. Danish club B 1901 from Nykøbing Faster came to Gambia for a tour and Biri Biri’s club Wallidan FC was invited to play against them. The match ended 5-4 in favour of B 1901, but Biri Biri managed to score three goals. Danish coach Kurt Nielsen then asked Biri Biri to play with his team against another Gambian opponent, which he did. This time Biri Biri scored four goals, and he was asked to join B 1901 and play in Denmark. 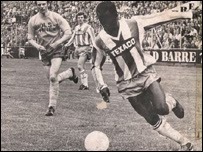 Biri Biri was the first African player to play in Denmark. Because the Danish league was only semi professional at the time, he got an extra job washing clothes at the Nykøbing Faster hospital. Biri Biri didn’t stay long at B1901, although he was a regular on the team and did well. B 1901 wasn't making headlines in the league, but did reach the Danish Cup final. They lost 2-0 to Randers Freja and it was the closest Biri Biri would ever come to any cup. Then a club from Spain showed up and put him on a plane to Sevilla. Rumour has it, at first it was Real Betis who wanted him. But during the flight and the stop over Biri Biri was convinced by board members of Sevilla FC to join their club. Both clubs played in the second division, so in sporting terms there was no difference. Things are very blurry concerning what really happened, it is clear though that Biri Biri said yes to Sevilla. For Biri Biri and Sevilla the first season proved to be a troublesome one. As rival Real Betis were crowned champion and got promoted back to the Primera Division, Sevilla came in ninth. Famous coach Ernst Happel failed and was fired in January 1974. Biri Biri hadn’t played much under the Austrian coach (five league matches, one goal). After his departure, he performed a lot better (twelve matches, eight goals) in the second part of the season. The next year, 1974-75 probably is the best of Biri Biri's career. Under new coach, Argentinian Roque Olsen, Sevilla finished third and gained the awaited promotion to the Primera Division. Biri Biri played nearly all matches and scored fourteen goals. He missed some matches because he would stay too long with his family in Gambia, for instance after spending Christmas there. Biri Biri mostly played as a right winger, using his speed and his skills. He could shoot with both legs, was a good header and full of tricks. And above all, he also was a charismatic man. No wonder he was a crowd favorite. Biri Biri dind't play at all during the 1976-77 season, due to a broken leg. For the 1977-78 season he was fit again. It was going to be his last season in Spain, collecting 28 league matches and six goals. Sevilla FC finished in eight place, but Biri Biri was left out of the team more and more as the season progressed. So during the summer, he was prepared to listen to new options. Somehow, there weren’t many, so Biri Biri came back to familiar grounds: with B 1901 Nykøbing he played a few matches of their remaining 1978 season. He stayed in Denmark for a couple of seasons, also being reunited with his old coach Kurt Nielsen, now at Herfølge BK. With him Biri-Biri had one last success: scoring five goals during the season he helped Herfølge BK to gain promotion back to first level in Denmark in 1980. He played there for another season, then returned home to Wallidan. In Gambia he hung up his boots in 1987, 38 years old. 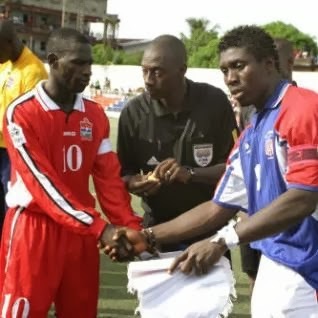 More than twenty five years later, Biri Biri is still considered the best Gambian soccer player ever. Duirng the early nineties, the first players from Gambia, definitely inspired by Biri Biri, found their own way into European soccer leagues. 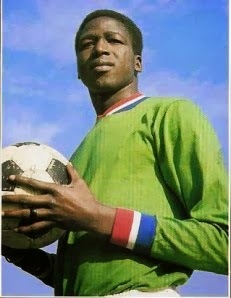 Like Jatto Ceesay, who had a great career mainly in the Netherlands with Willem II, later in Cyprus. Or Ebrima Sillah, with a career at Club Brugge (Belgium) and Rubin Kazan (Russia) and Njogu Demba-Nyrén playing in Sweden (BK Häcken) and Denmark (Esbjerg fB). 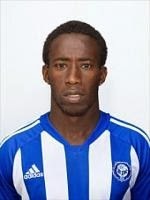 Nowadays Gambian players can be found all over the world. Ebrihima Ibou was third on the list of goal scorers list in Belgium last year, Ousman Jallow had some fine years (2008-2011) in Denmark with Brøndby and Demba Savage scored 38 goals in the last three seasons in Finland. Gambia is on the rise and Biri Biri is still involved. By his youngest son, Yusupha Njie, who has inherited some talent from his father. Travelling with the national youth team, Yusupha already had a trial at Norwegian club Brann Bergen and in 2010 his father gave him another change, at his old club Sevilla FC. But just like Biri Biri himself was sent away at Derby County, 17-year old Yusupha wasn’t given a contract at Sevilla FC. So he kept on playing for Real de Banjul, waiting for another chance. That chance came early 2013, as his club met Moroccan champion FUS Rabat in the first round of the African Champions Cup. Real de Banjul narrowly lost on away goals, but FUS Rabat signed him four months later. So now Njie is playing in Morocco with FUS Rabat. Still only twenty years old, the midfielder might be able to take another shot at Europe. Just like his father did.